Save the image and print it, the address is right under his name. In other news the demon-moronic circus swirling around the Breat Kavanaugh nomination continues. What can you do to help? Call your Senator, not that it will do much good, but it will be good practice for you. 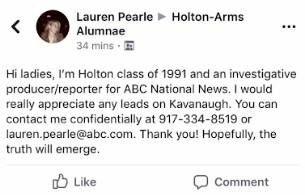 Second, As you can see Lauren Pearle from ABC is looking for leads on Kavanaugh to that the truth may be revealed. Why not pop off an email and/or give her a jingle and (politely!) giver her a heaping helping of truth? I’m sure she’ll appreciate it. I’ve been so busy I forgot to mention that the next meeting of the Republican Club will take place on September 28 at the La Canada Community Center from 7:00 to 9:00 PM. Again, light refreshments will be available. I’m hoping that, given our limited numbers, someone with a largish living/dining room will be willing to host us going forward as we didn’t make our nut on the August meeting.